Home » The Town » Recreation Ground » Friends of the Rec. We have had some great fun events in recent summers! A Summer Fair was held in 2011. A large crowd of Bollington folk came and had a great time despite the heavy shower of rain that got everyone running for cover! In 2012 we planned a similar event for the Queen’s Jubilee weekend. But the weather defeated us, and a Rock Band event went the same way. Torrential rain before and on both days meant that we had to cancel all the field activities that so many were looking forward to. But a good picnic was held in the Pavilion on Jubilee weekend with freshly cooked burgers being prepared under the verandah! So we were looking for better weather in 2013! Well it was better, if not perfect, for Rock on the Rec held on Bank Holiday Monday in May. There was a huge turnout – well over 1,000 people enjoyed the fun and games – great slides and many other stands for everyone’s enjoyment. A similarly successful event was held in 2014. Events of this kind are organised each year. 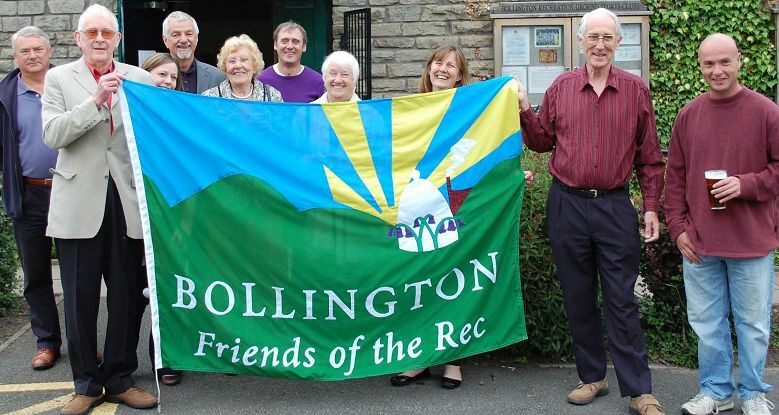 The Friends of Bollington Recreation Ground (FOBR) are an energetic group of volunteers working to help keep the ‘Rec’ as a welcoming place for the benefit and enjoyment of the local community. Working in partnership with Cheshire East Council, who are responsible for the upkeep and maintenance of the Rec, the Friends help with improvements to the general environment and appearance. The Rec is used regularly for football, cricket and bowls and the refurbished tennis courts are very popular in fine weather. View of the Recreation Ground with the Pavilion near left, the cricket field in the middle and the football field far right. The tennis courts and bowling green are on the far left. The children’s play area is on the left foreground with the Ranger station and car park to the right. The Friends are keen to promote the enjoyment of a range of activities by the local community. With substantial investment from the Borough Council the Rec received the prestigious Green Flag award (left) for 2008 and have retained this award every year since! The Rec was also the home base for the widely acclaimed Bollington Festival in May 2014 and for many years before. The Friends usually meet in each third month in the Pavilion at the Rec to review progress with improvements and to plan future activities. The scope of the activities of the Friends also extends to cover the adjacent Adlington Road play area. Please consult the Town Clerk at the Town Hall for dates of future meetings. Activities planned by the Friends include organising environmental surveys of flora and fauna, providing opportunities for local Schools to undertake nature studies and hold picnics and sports events, helping with maintenance of wild flower areas, borders and general tidiness of the site. The Friends have been successful in obtaining funds to build an outstanding, and very popular, skate park, as well as a number of upgrades to the children’s play area, including the installation of several modern play devices. New volunteers are most welcome and should contact the Town Clerk at Bollington Town Council and come to one of the regular meetings. John Kershaw, left, and Michael Burdekin hold up the FOBR flag with the support of other friends! Picture: Lee Wainwright. 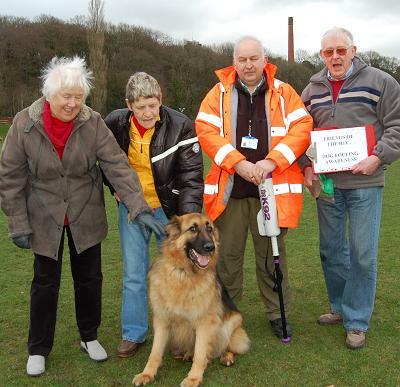 The Friends organised a number of dog awareness sessions which were held on the Recreation Ground. The purpose was to ensure that all dog owners who regularly walk their pets through the Recreation Ground fully understand what is expected of them with respect to maintaining control of their dog(s) and preventing fouling. The latter has at times been a serious problem but in more recent times the message is getting through that leaving fouling in the public areas is just not acceptable, as well as being illegal. The first dog awareness session with, from left, Alderman Sylvia Roberts, Joan Bradley, Tony Forrest and FOBR chairman John Kershaw. At the first session FOBR chairman John Kershaw together with the Macclesfield Borough Council Environmental Enforcement Officer, Tony Forrest, and dog Psychologist and Behaviourist, Joan Bradley, were joined by several volunteer Friends to intercept dog walkers, give them the MBC leaflet on the subject, and ensure that they all knew the rules. 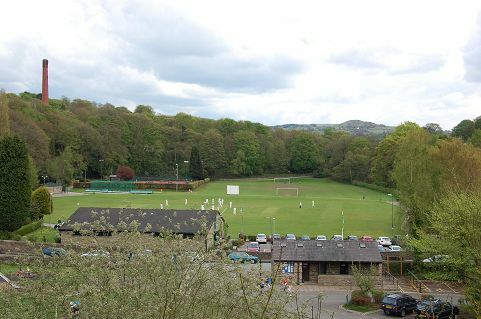 Bollington Cricket Club – this thriving club fields nine teams from First XI to Under 11s. Did you know that Bollington Recreation Ground was once the Cheshire County Cricket Ground? Amazing but true – in 1908!